I survived a weekend in New York with a bunch of bloggy friends. To sum it up quickly, it was TOTALLY BITCHIN. Yes. 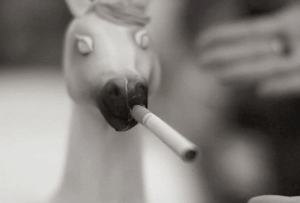 That is a unicorn cake smoking a cigarette. A menthol, to be exact. I’m glad we could help it check the weather. I got to meet Ryan Marshall of Pacing the Panic Room fame, as well as all of my favorite bloggers (except Aunt Becky. Sad face). Seriously…just thinking about the awesomeness of the weekend (and then recognizing that I’m back at work in my cube) is nearly sending me into tears/convulsions/laughing fits. I’m going to start working on a few posts trying to sum it up in my own words over the next few days. I have lots of photos to go through. Look out Flickr. This. Photo. Is. Amazing. I love that you were involved in its creation! I love Pacing the Panic Room! Very jealous of your meetup with Ryan Marshall. If I win the lottery I’m paying him to do maternity shots of me with my next baby.